You are twenty-two months today; two months from turning two. It’s hit me sort of funny in a way I wasn’t expecting. We were going along with life, being busy with the holidays and New Year and then suddenly…it was only two months until your birthday. Two months to two years. You have changed and grown so much. I search for that sleepy baby with the hair like feathers that once curled up under my chin in a swaddle to nap. I don’t know where he went. I search for that quiet, stoic baby who took everything in and refused to smile on demand for anyone. I don’t know where he went either. You spent your whole first year somehow connected to me. Ok, at least your first six months. The next six months I had to go back to work, but when I was with you, you were on my hip or in a carrier or on my lap. If we went anywhere, you clung to me. You’ve always loved your daddy (Dad-do, as you call him), but in the past few months you’ve acquired quite an affinity for doing whatever he is doing. As soon as you hear the garage door open you pop your head up and say, “OH! DAD-DO!” Then when you hear the door open you jump off my lap or spring from the floor and haul buns to the gate at the top of the stairs yelling, “DAD-DO! HI!” You want him to hold you, read to you, tickle you. You’ve starting clearly saying Eddie’s name to: AH-DEE. When you see his picture you say his name. When he walks in the room, you point and announce him. He is very independent, but you are more cautious about new places. When Eddie sees that you are are upset in a new place (like nursery at church), he so kindly calls you over to play so your dad and I can slip out. He takes care of you and wants to make sure you are Ok.
Because he has started playing with you, you have become slightly obsessed with being able to do every single thing AH-DEE does. If he gets juice, you want juice. If he gets a twizzler, you need one too. If he is coloring, you climb up on a kitchen chair to do it too. Usually Eddie is very patient with you, but sometimes–like when you try to actually sit ON him by the kitchen table–he loses his cool and calls me in for reinforcements. Those are the times you get mad, Bird. Recently we were up north with the majority of the Sluiter Family and everyone commented on how you were SO GOOD. How you NEVER fussed. Your dad and I just laughed because you totally “fuss”. In fact, you throw balls to the wall tantrums. When we have to tell you “no”, that is unacceptable to you. You scream. You cry. Your legs stop working and you refuse to be anything but toddler dead weight on the floor. If we try to pick you up, you arch backward or hit or scratch or pull hair. You are a bit more of a beast than a Bird as of late. But only when you don’t get your way. The rest of the time you are happy and chipper and so SO funny. You are quite the chatterbox, but only when you are comfortable with your surroundings. At home you talk non-stop. My favorite thing is after we put you down to nap or to bed for the night because you will chatter on in there with your stuffies for up to thirty minutes! I can hear you doing the “woof woof” sound for your puppy and “meow” sound for your kitty and tons of other “talking” sounds. Eventually you talk yourself out and fall asleep. Your vocabulary expands by the day. Just today you asked me to read you the “Elmo” book. You said “Ah-MOE, MAMA”, so we read it. You pointed out Abbie and looked at me while I said it. Then you went through the book again and you kept pointing her out for me to say. Finally at the end, you pointed out “AH-MOE” and then you pointed and said, “AH-BAY BEE”. Then you pursed your lips in that little smirk that tells me you are pretty darn proud of yourself. Your hand-eye coordination/fine motor skills are almost ridiculous for a kid your age. Today daddy watched as you put each shape into your shape-sorter correctly with no help. You don’t jam and cram, you carefully twist each piece in the hole you know it goes in. You do this with puzzle pieces and Duplos too. I watched you pick up a crayon the other day at the doctor’s office to color while we waited for our turn. You picked it up and held it correctly. I just watched. Books are your newest and favorite thing. I think we have read Hippos Go Berzerk over a thousand times…just today. I love this new love of yours, but seriously, let’s expand to some other stories. We have a whole PILE of board books. I do that a lot with you, Charlie. I just watch you play. I watch you go about what seems to be your “work”. You can be so serious about it all, but you love to play. You love to explore. You love to figure out how things work. Your favorite things are Duplos, BIG trucks, stuffies and blankies, and anything Eddie is doing. You love to run and laugh, and one of my favorite things is your deep, belly laugh. I also love how much you love to run around the house without a stitch of clothing on. I can tell you feel free and I know I have to throw a diaper on you because you WILL pee on the carpet, but you just love to RUN! Your blond curls fly behind you as you book it through the entire upstairs just laughing until tears stream down your face. I hope you always have a love for Eddie and your Dad-do and your MAMA. I hope you always have a belly full of chuckles. It’s hard to watch you go from baby to little boy. My arms ache for that tiny birdie you once were. My nose remembers your baby smell. My heart hurts when I think about cutting your hair in a couple months (because that is the deal I have with daddy. I get baby hair for two years. Then snip snip). Two more months of “baby”. I will take that two months and I will snuggle it up. I love these monthly Bird updates because it’s such a reflection on my Scrumplet. Especially saying their big brother’s names, and announcing them, pointing to them. Mine likes asking where his brother is too, by name. All. The. Time. Alison recently posted…What’s In It For Me? 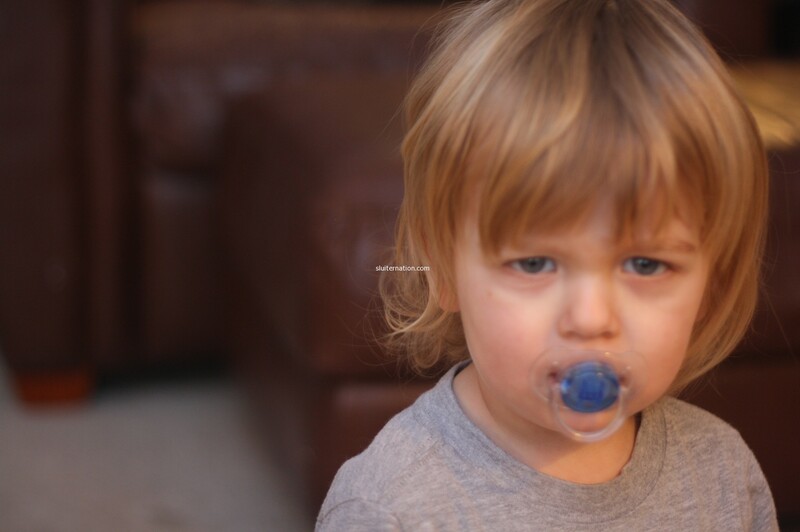 I bet he’s still adorable when he has tantrums, though! bigga boy! love those swirly curls. Isn’t it the cutest when they start to say their siblings names? I love that. That’s a cute deal. Baby hair for 2 years. I never minded cutting it. 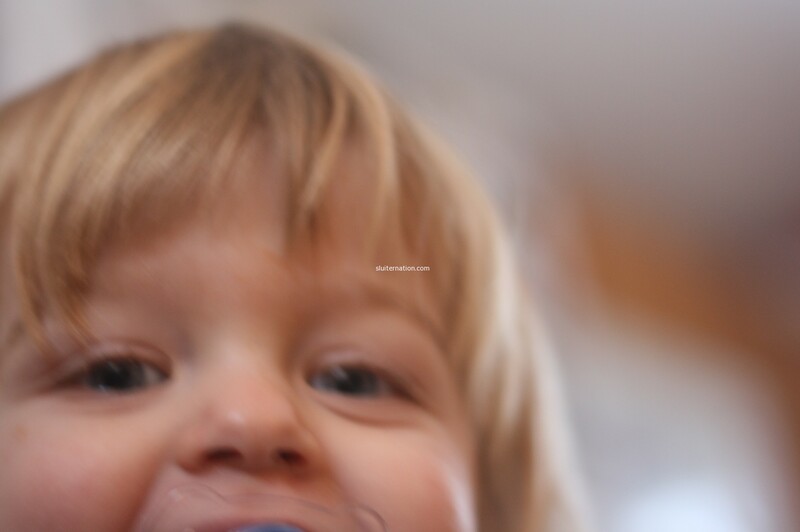 I can see that I still want to baby my youngest, but he’s FIVE. I just need to stop that. 🙂 But I remember too. I remember the baby smell and the cuddles.I miss it. 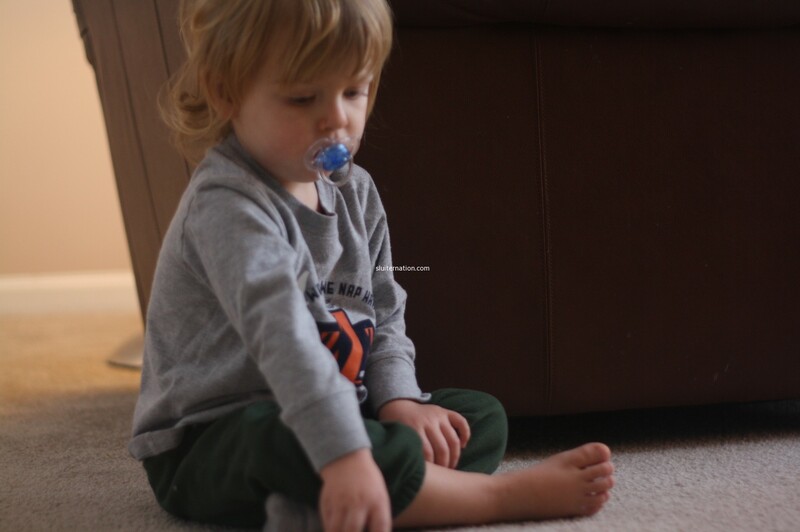 I refuse to believe that he’s almost two. It’s weird how much I identify with you and this even thought I’m one man who lives with 4 women. We notice things that other parents don’t, I think. At least our perspective are skewed in a way that we’re more aware of idiosyncrasies, maybe? The months slip by through our fingers while the minutes sometimes drag. Almost two hardly seems possible. But he is beautiful and so are your words about him. I love getting a peek inside your world. I love the brother realationship that my boys have – and how it started from the beginning with my oldest looking out for the youngest, and continues to this day with the youngest still watching and emulating everything his big brother does. Sweet boy. That transition from little to big is so awesome, and it happens so fast and slow at the same time. I think I might cry with you when you cut his hair. I just want to put my nose in his curls. I seem to forget he’s not that much younger than Piper, although he sounds WORLDS ahead of her developmentally. What a cutie pie. Maybe we need to set our kiddos up on a blind date — b/c then? our kids would each have the BEST IN-LAWS EVER. Or maybe just Piper would. You might not love us so much. erin margolin recently posted…Mean Girls Already? And those photos/ To die for! Oh that grumpy face – I die!! I have one of my daughter like that. she could do the toddler dead weight So Well!! oddly, it’s one of my fave pics of her. It just captures that sass she has. But we let her. no one else can get away with that. she’s just so cuddly. 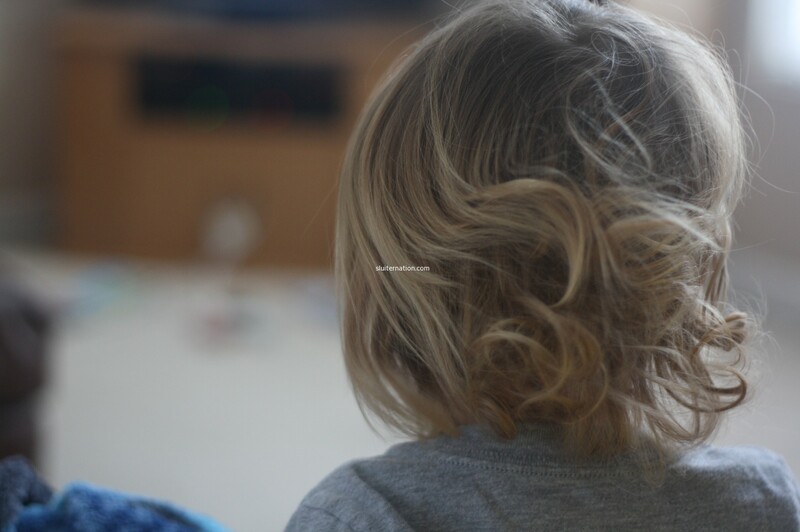 Can I pay Dad-do to NOT cut the hair? Please? It’s so awesome. I love all the details you gave us about him. SO smart and cute.